"An Experience with Ancient Amazonian Medicine for Self, Community and Planetary Renewal." Basilio Payaguaje, a master in the ingestion of heroic doses of strong entheogenic plant medicines, is the ceremonial guide for the January 2016 Rainforest Medicine Council. He is one of the few curanderos from the Secoya Community in the Ecuadorian Amazon. He is accompanied by Miguel Payaguaje, one of the few youngest Secoya apprentices. Josep Rosas will also be present. He is a student of the Secoya traditional way of life and will be the interpreter for Basilio, who is in his 70's and only speaks Pai'cocá. The exploration of rainforest plant medicine traditions will be ushered in by these legendary time-honored maestros from the Ecuadorian Amazon, good elders who were raised in the wilderness, living traditional ways of life that include copious ceremonial meditations. Our good elders share visions and designs too spectacular to be acquired in any other way, other than sitting with them through the timelessness of the cool nights of Yage. Indelible on their way of being is this "great spirit, bedecked in designs, aromatic, beaded and leafy," acquired while fasting with their maestros in their wilderness motherland. Long before roads and interruption from modernization occurred, these whole-hearted elders already understood the entire picture! Their presence represents both the sacred gift and the serious joke that is life, and a whole lot of fun! The designs they embody were garnered in times of antiquity, and while older than old, they are also newer than new. Seeing them offers an ever-pertinent navigation perspective for these tumultuous times. They are traditional Secoya elders, torchbearers of a millenary spiritual tradition, who will be the ceremonial guides during both councils. The Secoya, or as they are called among themselves, the Siecopai, are an truly authentic, millenary Amazonian society, whose name means "Multicolored People." The elders embody a culture and tradition of immense spiritual magnitude. While dwindling, as this modern era tears at the seams of the most ancient fabric, this way of life, a heritage of humanity, is an ever effective time-tested medical system of universal significance. The spiritual and ceremonial science these elders embody and joyfully transmit is one of the great wisdom traditions of Gaia, its magnitude just beginning to be understood. This is the spiritual science of "God's Multicolored People." Kindling the lights of the most ancient prophecies, of universal oneness, and how to understand and achieve this as a tool for happiness, seamlessly helping improve every aspect of one's life! A way of life that brings all subtly together back onto the one great path of universal whole-hearted living, the one that walks alongside everything and everyone together towards an integral salvation for all species alike. Sadly though, due to geopolitical borders, the encroachment and harassment of the petroleum companies, as well as the impact of colonization now imperil their culture and ancestral lands. Despite these changes the Secoya live with grace, whole-heartedness and natural presence, and are happy and willing to share their wisdom with those who come with sincere hearts. 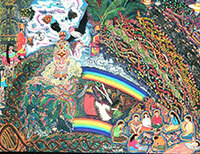 Our relationship with the Secoya is based on a long-standing genuine friendship of love and reciprocity that began in 1994 when Jonathon S Miller Weisberger began working with the community and facilitated a process of ancestral land reclamation that led to gaining access to a large tract of ancestral lands on the Ecuadorian and Peruvian boarder area. The trips began as a way to fund the work that since their onset in 1994 have channeled significant percentages of tuition proceeds to rainforest and wildlife conservation initiatives, as well to traditional elders and indigenous peoples communities in Ecuador. Since 2003 tuition proceeds have also supported a marine turtle conservation initiative in Costa Rica. Through these acts, the events have benefitted plant, animal and human communities far beyond the first circle of the gatherings participants. Funds are allocated and used where the needs are most prevalent, and we have learned from our knowledge at ground level, how to make a lot happen with a little. (2000-present) Building and repairing homes of the traditional elders, the building of ancestral lodges in the village for teaching centers and cultural revalidation, building fiberglass canoes for traditional families and attention to some health needs of the elders such as dentures and hearing aids have been accomplished. In 2010, a successful conservation initiative in Ecuador led the enlargement of Napo-Galeras National Park! Here at Guaria de Osa Ecolodge, a marine turtle conservation initiative has been overseen since 2003! (1995-2000) Among the Secoya some of the works take the form of publishing a bilingual education booklet on health and life (natural medicine and ethnobotany) and a cosmological wall calendar. Projects such as cultural revival workshops among elders and youth have been accomplished and actualized. From 1994-2000 we spearheaded a process to assist in territorial land reclamation and cultural revalidation initiatives among several indigenous communities in Ecuador. In the high Andes, funds were given for materials to built a community water tank that benefits over 50 families at a reforestation initiative we have supported since 1995. Most recently the Guayusa Tea House is being developed. This project is a "market driven rainforest conservation and restoration initiative," linking rainforest conservation and good health by offering what we consider too be the finest tea on earth to a much wider audience, linking bridges and pathways towards sustainability, environmental awareness, rainforest conservation, sustainability, fair trade and good health. Ethnobotanist Jonathon S. Miller Weisberger says: "Our approach is holistic and direct in nature. It is aimed at finding creative ways to facilitate renewal, and thus bridge the many gaps that erode the fundamental pillars of the paradise that is earth, so as to safeguard the rainforest, ancestral wisdom and integrity on the plant." In synergy, since 2006, mindful fellow travelers from our global community have come to participate in our council gathering, with a beginner's mind, for an uplifting experience with traditional plant medicine maestros, experienced ethnobotanists, skilled holistic health practitioners, for an unforgettable adventure and celebration in wellness and renewal, in ecological and self-discovery! 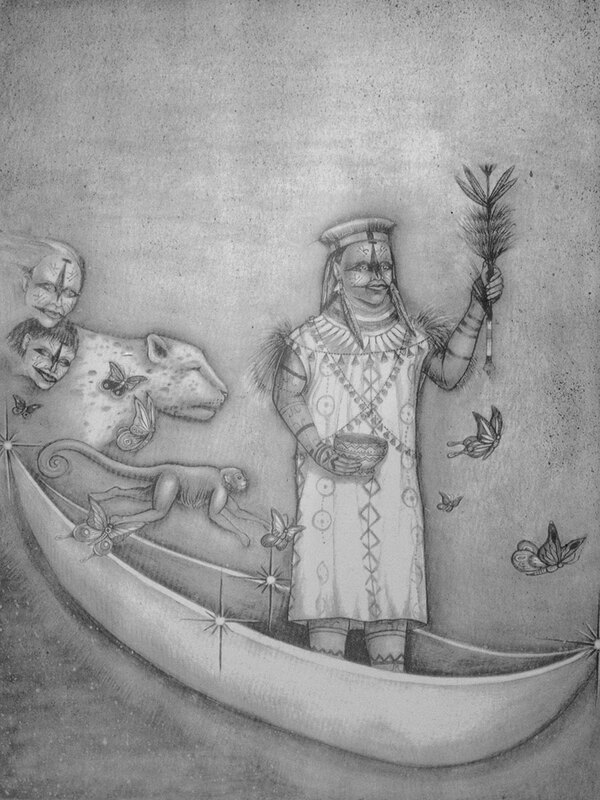 Ethnobotanist Jonathon S. Miller Weisberger is an enthusiastic storyteller whose extensive and knowledgeable understanding of rainforest medicinal flora and indigenous life and world view is unique. A rainforest conservation advocate, he has collaborated ethnobotanical studies with 5 distinct indigenous communities and tribes in the Ecuadorian Amazon and Andes from 1990 - 2000. Since 2000, Jonathon lives 9 months a year in Costa Rica's Osa Peninsula at Guaria de Osa EcoLodge. He is author of Rainforest Medicine: Preserving Indigenous Science & Biodiversity in the Upper Amazon, director of CCBD (Council for Cultural and Biological Diversity), and steward of Guaria de Osa (Orchid de Osa) Ecolodge. 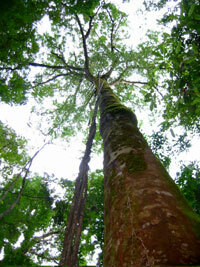 He is an intrepid and knowledgeable rainforest guide with more than 15 years of ground-level experience. A hike with Jonathon must not be missed as he guides you to explore the primary, spectacular rainforest surrounding Guaria de Osa. Jonathon will serve both councils. Fire-keeper Josep "Waosutu" Rosas, steadfast to the Secoya tradition, who lives in Ecuador and has been in service to the Secoya elders for nearly six years. He accompanies them from Ecuador to the Guaria de Osa EcoLodge. Josep is their helper and attendant at the council gatherings. He is also the assistant ceremonial cook and fire keeper. Josep will serve all 3 councils. Vegetarian Culinarian Andrea Davis has a background in organic farming, permaculture, and herbal medicine. She is half-Panamanian, traveled thru Latin America, and passionate about protecting our beautiful Mama Earth and the many beings that we co-inhabit her with, as well as Indigenous Rights, education, nourishing food cultivation and culture, and a deep physical/emotional/spiritual healing and practice. Inspired by her Latin roots, Andrea has knowledge and stories about the Amazon and beyond. 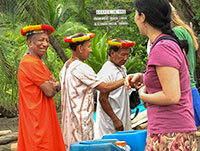 She has lived in Ecuador among Kichwa and Secoya Communities. At the Councils, Andrea will lead 5 rhythms dance sessions for those who would like to wiggle and giggle a bit more. Andrea will serve all 3 councils. 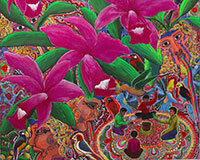 Jais Booth, Artist, whose intention at the January 2016 councils is to facilitate art-making so as to bridge one's rainforest medicine experience with one's western cultural mindset in order to integrate, effortlessly, the wisdom of La Medicina into our daily lives, as this is what she aspires for herself. 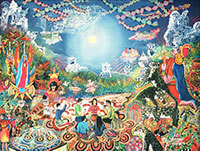 "I have facilitated workshops at retreats and organizations since 2002 and have a Masters in Transformative Art. I am grateful to the Spirit world and to Guaria de Osa for the gift of being able to participate and to share my talents." Jais will serve at both Council 1 and 2. What to bring for art-making activities with Jais? Art supplies will be provided for expressive arts therapy to facilitate integration of experiences during the Rainforest Medicine Council. However, bring your own art supplies if you also wish to paint on location with Jais. For example: small watercolor kits, paper, brushes, tempera paints. No oils, or oil pastels, as the cleanup is challenging. No art experience necessary. Julian Keenan Grow, Acupuncturist, connects most with the archaic roots of acupuncture and Chinese medicine originating as a shamanic art. He is near completion of his Doctoral degree in traditional Chinese medicine at the Pacific College of Oriental Medicine in New York City and will soon be a Doctor of Chinese medicine, licensed acupuncturist, and national board certified Chinese herbalist. Julian prefers a treatment strategy which addresses a combination of the physical, emotional, and energetic complexities of a person. He views acupuncture as an initiative catalyst for a larger healing process. Julian will serve Council 1. Deb Buck, Yoga Teacher & Clinical Herbalist, from Colorado - In finding full enjoyment through which yoga combines strength, flexibility, breath and mindfulness, Deb embraces yoga practice as something that can nourish our spiritual way of life and facilitate pathways back to our true nature. She teaches yoga at Yogadurango in Durango, CO. She has trained with the amazing teachers at Yogadurango and with Indira Kate Kalmbach at the Pavones Yoga Center in Costa Rica. Her specialty is to encourage students toward self exploration through their connection to nature and exploring how our yoga practice can be a metaphor for how we choose to be in life. As an herbalist, Deb has an incredible devotion for facilitating the transmission and reception of plant medicine in the oral tradition. She understands the significance of conveying the messages of the Earth and the voices of the plants to create space for building lifelong relationships with the plants. Through teaching yoga and plant medicine, Deb enjoys fusing devotion, strength, integrity, and grace in order to inspire contagious enthusiasm in service to Mother Earth. Deb will serve Council 2. Emily Casey is honored to serve with the wellness team at the January 2016 Plant Medicine Councils. She comes to Guaria de Osa brimming with enthusiasm to learn, teach serve, and heal deeply. She is a certified Hatha and Kundalini Yoga Teacher and Theta Healing Practitioner. Weaving her experience with Kundalini and Hatha Yoga she offers classes that aim to create space for integration and provide tools that carry you beyond the gathering. Emily will serve all 3 councils. Dylan Hunt has been practicing Shaolin Kung Fu and Tai Chi Ch'uan for over 7 years and is ranked as a black belt in Shaolin-Do Kung Fu under Grandmaster Sin Kwang The. Dylan has extensive training in Shuai Chiao Kung Fu and Yang Style Tai Chi under master Alexander Knight and has completed the rigorous Chi Kung training of Jingui Golden Shield under the guidance of Dr. Bob Zhang and Tim Chrisco. In addition to the martial arts, Dylan practices daily Yoga, primarily inspired by the style of Ashtanga created by Patabi Jois. He believes in bringing his body, mind and spirit to optimum health through continual physical practice, conscious awareness, kindness and laughter. He lives in Costa Rica with his family where he teaches Tai Chi in his local community, as well as Shaolin Kung Fu to kids and adults. Dylan will serve all 3 councils. 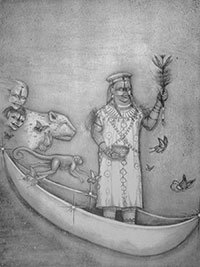 Bronton Cheja, who likes to be called Cheja, has been engaged in the art of poetry for 40 years as a pathway for creative joy; to explore his inner and supra-rational realms. He writes: "My poems range over many terrains of the Earth and terrains in my heart. They are an overflow, undertow, personally universal, emotionally logical, bodily spiritual, expression of love, existentially divine and beyond analysis. My work is to create a space, an atmosphere and a receptivity that allows others to see into oneself deeper and clearer. To understand one's inner truth, one can then act consciously with integrity and create authentically. 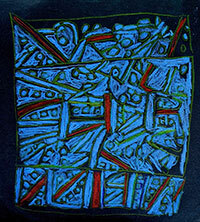 My work aspires to catalyze and assist alchemy to take place." Cheja will facilitate creative writing sessions, so please bring your writing tools. He will also assist Jonathon and guests participants in whatever way needed during daily activities. Cheja will serve Council 2. Lesley Hudson, Massage Therapist, began her journey with the healing arts 10 years ago when she spent 3 months studying Thai massage in northern Thailand. Although this did not become her career path at the time, it was a marker of the beginning of a journey in which Lesley would continue to find her path woven within the context of "healing". Lesley became a certified yoga teacher in 2009, and more recently completed a massage program steeped in taoist philosophy and asian bodywork modalities. "Through bodywork I invite another being to come back to a state of rememberance of their own divine nature. I offer an integrative massage using swedish techniques, shiatsu, reflexology and acupressure as foundational modalities. When working with a client I choose a treatment plan to address concerns on all levels; physically, emotionally, mentally and spiritually. My intention when working with an individual is always 'May the healing take place that is in the highest good of this person right now.' " Lesley will serve Council 3. Orchid of the Osa Ecolodge, located in the remote "people friendly wilderness" rainforest at San Josecito Beach just south of Drake Bay on the Osa Peninsula's westernmost cove and just north of Corcovado National Park. Corcovado National Park, endorsed by National Geographic as "the most biological intense place on the Planet is right next door. And the "Floating Butterfly" also known as "Island of the Navigation Spheres of Giants" (most commonly known today as Ca�o Island Oceanic Reserve) can be seen as if suspended in the pristine blue green waters before the lodge. Rio Claro surf break (a paradise rainforest river) is a casual 45-minute walk down the beach, where there are waterfalls, secret beaches and forest paths to discover and enjoy. For these reasons and so many more the region is sometimes called, "The Little Amazon by the Ocean!" To Experience the prehistoric origins and vital importance of Plant Medicine Traditions from the Upper Amazon as taught and lived by the Secoya elders for centuries. To provide an opportunity for renewal of body mind and spirit through rainforest plant medicine traditions that act as a catalyst for auspicious transformation and tangible human progress. To make known the holistic indigenous ceremonial science of "God's Multicolored People" (translation of "Secoya"), under the tutelage of skilled Secoya wisdom keepers, the traditional elders, accomplished "torch bearers," and adepts of this sacred spiritual culture. 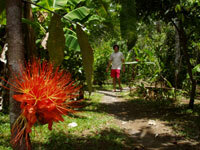 To experience tropical biodiversity in a remote rainforest wilderness and beach setting. Meet a pristine Pacific Ocean and the mighty rainforest ecosystems of the Osa Peninsula, where birds, plants and wildlife abound, sing and play. To facilitate right livelihood by creating work opportunities for people in remote ecologically sensitive regions and raise funds for rainforest conservation and cultural heritage projects. Tuition proceeds & sales of all traditional Secoya arts & crafs and ceremonial atire, as well as Pablo Amaringo visionary art replicas, available at the event, will be channeled to rainforest projects overseen by the CCBD (www.4biodiversity.org), supporting traditional elder masters in the Amazon and a Marine Turtle Conservation Project on the Osa. To cease all expectations and you have everything. To expand one's guts and grace. To become a better friend to oneself. Discount: offered for more than 1 council. We ask everyone to begin the Council Gathering on Day 1 and end on Day 11. If you wish to arrive early and/or depart later, please ask for availability and extra fees. Consider registering as soon as possible to guarantee a space for this epic, stellar experience! In order to reserve your space, investment is to be paid in full. Thank you. changing the outer world from within. Please Note: all activities are optional since we understand that sometimes to do less is to do more. Note: The wellness & vitality enhancing effects of sunrise renewals balance the body's pH and are crucial to any healing or detoxification program & for preventing disease. In today's modern society, most people are acidic as a result of diet, sedentary (or overactive) lifestyles, stress, pollution, and the accumulation of chemical and heavy metal toxins. This time-tested millenary tradition from the Secoya People of the Amazon, for personal and planetary re-birth, uses well-prepared, highly refined plant medicine to promote spiritual & physical renewal, allowing one to move closer to spiritual understanding, personal growth, vitality, wellness and renewal, in quantum leaps! 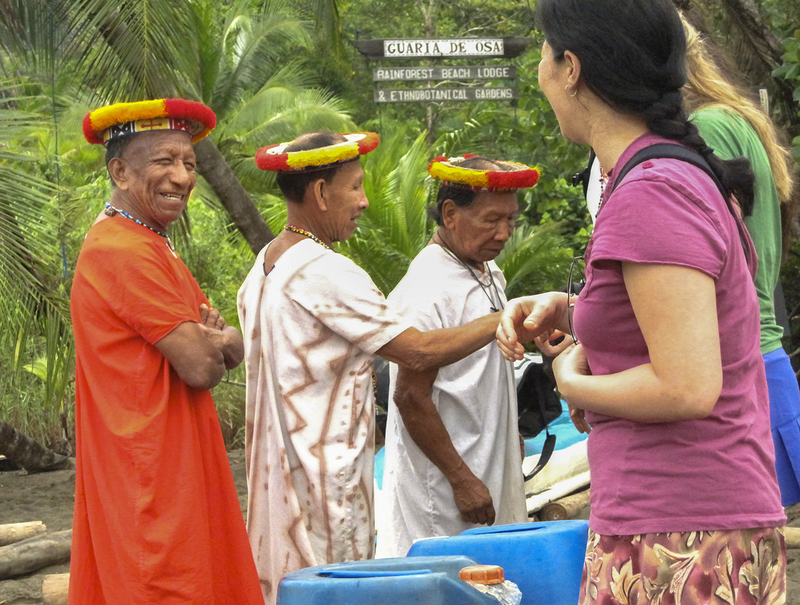 Read: Rainforest Medicine: Preserving Indigenous Science and Biodiversity in the Upper Amazon. Experience the prehistoric origins of Plant Medicine Traditions from the Ecuadorian Amazon as taught and lived by the Secoya elders for centuries. Welcome the past, present and future importance of Indigenous Plant Medicines and its healers and gardeners. Appreciate the connection and relationship of plant medicines with the ancient traditions of Tao. Connect the magnitude of these two Indigenous Spiritual Sciences and aspects that nourish renewal and wellness in our personal life, our community life, and the life of our environment, locally and globally. Expand one's guts and grace. Enjoy arts and crafts sessions and Secoya-style face painting with homemade aromatic face paints. Explore indigenous worldview through Origin mythologies, and fireside storytelling and listen to rare recordings of master healing chants. Discover tropical nature and rainforest ecology on observation walks and or treks into the nearby rainforest, where plants, birds and animals abound! Meet and learn about prominent plant allies on guided in-depth ethnobotanical plant walks. 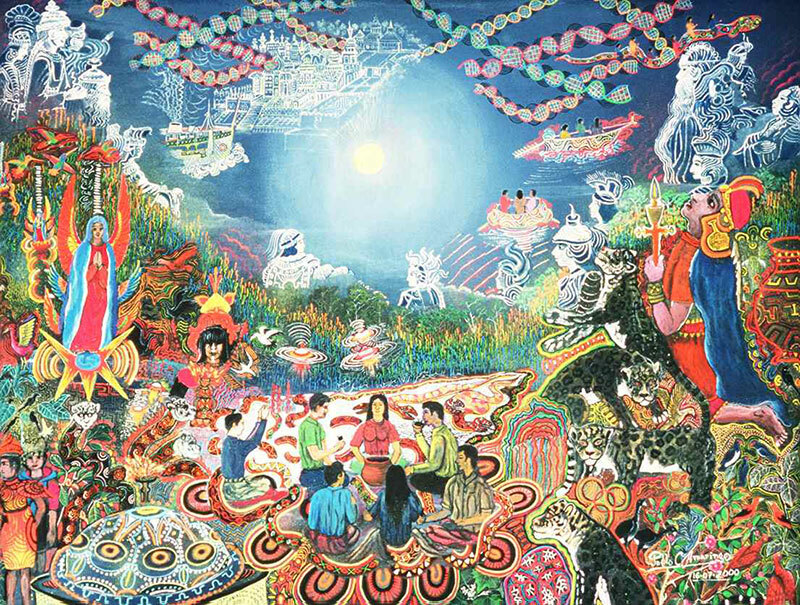 Connect the magnitude of ancient Spiritual Sciences and the aspects that nourish renewal and wellness in our personal life, our community life, and the life of our environment, locally and globally, through evening talks and group dialogues. Circle together to hear each others journeys from the night before. 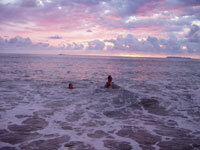 Swim, snorkel, surf a sparkling Pacific Ocean, just a 3 min. stroll through Guaria's ethnobotanical gardens; enjoy a hammock siesta in front of the beach; or a Whale and Dolphin tour, scuba or snorkeling at Ca�o Island Oceanic reserve; enjoy waterfalls. Benefit from the Wellness Modalities with holistic wellness practitioners during the Council. Have a favorite hammock? Bring that too! Or purchase a perfect handmade hammock from the Secoya. Prices range from $300 for cotton and $600 hand-woven chamber rainforest palm fiber. Group round-trip Osa Peninsula transfer means: Palmar Norte to the river town of Sierpe by land; boat from Sierpe to Playa San Josecito OR Drake Bay land from airstrip to Drake Bay beach by boat. Please Note: Guaria's international staff will make your San Jose hotel reservation and your domestic air reservation. You will be notified how to pay the hotel and the domestic flight soon after you register. All San Jose expenses: hotel, taxi transfer, meals, etc. Gratuity: We gratefully accept the customary tip/gratuity of $10/adult/day for our service rendered with quality awareness. Please give your appreciation for our attentive assistance to the administrator who, in turn, will distribute to Guaria's staff - both "on stage" and those "behind the curtain." In other words, please leave your tip at Guaria rather than mailing it to California address upon your return. We thank you in advance. To reserve your extra days, and your non-group Osa Peninsula transfer, please pre-pay. See How to Pay link. We suggest a separate $100 donation to the Secoya Curanderos (healers) which will support their families in the Amazon. Important: Present your donation to Jonathon, who will earmark donations to other Secoya members who couldn't attend the Council yet are in need of financial assistance. What to bring for art-making activities with Jais? Portable art supplies you may be familiar and comfortable with using. For example: small watercolor kits; paintbrushes; small water cups, paper, glue, crayons, water-soluble crayons, pastels, pencils, brushes and sponges. No oils or oil pastels or canvas as the cleanup is challenging. Internet Fees: Due to limited service and high cost of our remote Internet connection, Internet time must be rationed, and we ask for a donation toward the cost of the Internet for those who use it. We have a public laptop for guest use, or you can bring your own laptop or other mobile device and connect to our wireless network. We accept Costa Rican Colones or US Dollars. Note: We cannot accept personal checks nor American Express Travelers Checks nor money orders because the banks in Costa Rica take more than 6 months to cash. Thank you for networking this once in a lifetime event! Dahlia and Ladna Miller (mother & daughter) are the ones who will get you to the Ecolodge effortlessly by arranging all your Costa Rican logistical reservations and transfers. They will send you additional information as well, a what to pack list and more detailed info relating the gatherings. 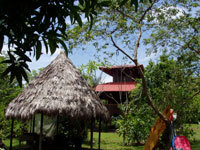 Once you get off your international plane you will be escorted all the way to the Ecolodge. In the memo of your check please write which council date you are paying for. Please check your passport to make sure it is valid for at least 3 months after you leave Costa Rica. Costa Rica requires everyone to purchase a round trip ticket. Before you purchase your international flight ticket, please e-mail us the itinerary to review. Thank you. Are you coming to Costa Rica from a country with risk of yellow fever virus? If in doubt, please consult this information. Note: Yellow Fever vaccinations must be valid for at least 10 days and the certificate must be shown at the airport before boarding your flight. We suggest participants arrive into San Jose, the capital city of Costa Rica, at least one day before your Council Gathering starts. Outside Santa Maria International there will be a shuttle transfer from Hotel Adventure Inn waiting for you. Please ask us for instructions how to reserve for the shuttle transfer from the hotel to airport. We will give you instructions how to pay for your hotel room and receive 10% discount as Guaria de Osa's guest. Angola, Benin, Burkina Faso, Cameroon, Democratic Republic of Congo, Gabon, Gambia, Guinea, Liberia, Nigeria, Sierra Leon, Sudan, Bolivia, Venezuela, Brazil, Peru, Colombia, Ecuador and Guyana, even if your were only transiting through any one of these countries. Please contact the Costa Rican consulate in your country to ask how many days prior to arriving into Costa Rica do they require that you have the yellow fever vaccination. If so, you must travel with your yellow fever vaccination card to show the Costa Rican officials at Santa Maria International. 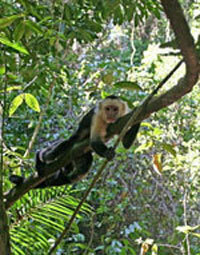 For additional information on other related Costa Rican details, refer to: Costa Rica Tourism FAQ page. When we send you your reservation confirmation, you will then receive instructions how to pre-pay directly. As of 2015, round trip cost $284/person. Their fees include airport transfers before and after international flights, free international phone calls; low rates, great breakfast, comfortable spacious rooms. Visit: www.adventurehotelsofcostarica.com. 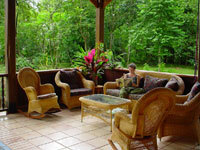 Mention you are a guest of Guaria de Osa EcoLodge on the Osa Peninsula and you will receive a significant discount. Guaria's safari-jeep contact will meet you at Palmar Sur airport to drive you to the river town of Sierpe (about 45 minutes). Wait for our boat captain at Oleaje Sereno Coffeeshop, located by the Sierpe docks. Beautiful floating water hyacinth plants are seen on R�o Sierpe during this impressive water journey. R�o Sierpe (meaning 'serpent') curves by a panoramic vista of 54,000 acres of Sierpe-Terraba Mangrove Reserve - home of the largest most intact mangrove reserve in tropical America! Departing the mangroves, the boat (known as 'panga') goes thru the mouth of the majestic Pacific Ocean - another dramatic moment! Most times you can see whales, dolphins, a variety of birds, all enveloped in an unforgettable tropical ocean breeze. This water journey takes about 1 hour (4 miles) on the Sierpe River and about 45 min. (21 miles) on the Pacific Ocean to the beach landing at Playa San Josecito. Our boat captain waits for you at Playa San Josecito and our staff will help you with your luggage. From Playa San Josecito, there is a 20 min. boat ride along the Pacific Ocean to Drake Bay Beach. A safari-style jeep will transfer you to Drake Bay Airstrip - about a 15 min. land trip through the jungle until you board your domestic flight back to San Jos�. This journey, as is the entry, is what movies are made from. From Drake Bay Airstrip to San Jose, you'll witness a spectacular vista of the Rainforest Canopy of the Osa Peninsula. Secoyas love to bead. Together you can have beading time and learn yajé designs. Bring glass beads (small and medium size beads) and small seed beads; beading needles nylon thread and wax. Primary colors for beads, such as, red, yellow, green, blue, and white. Colorful bandanas to wrap around neck and/or forehead. Although this list is extensive we trust each one knows what to pack for a beach / rainforest environment. Please use this inventory as a friendly reminder and a suggested checklist. Although porter service is gratis "on the house" - please pack what you can carry. The walk from the beach landing at Playa San Josecito to Guaria de Osa is about 20 min. 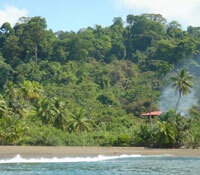 south along a beach and forest trail with the Pacific Ocean to your right and the Rainforest to your left. Lightweight fabrics, mixture of rayon and cotton (not 100% cotton) dry easier in the tropics. Include something to keep you warm in the cool jungle evening. Since there is neither a local store nor drugstore down the beach and/or around the corner, bring your personal items. If you have a high metabolism, bring your own snacks. Women who may get their moon during their visit please bring your own pads. At Guaria there are several hammocks. However, if you would like to bring your own hammock also bring webbing or chord (about 20 feet). Please bring ALL your plastic wraps (including diapers) and dead batteries back to your home country for recycling. Please leave NO trace behind you. Amazon Smile: In case you have to do some shopping and are thinking of using Amazon for your supplies, please be so kind to consider the following request: Amazon has a program called Amazon Smile, through which Amazon donates one half of 1% of all purchases to your choice of any nonprofit charity registered with Amazon Smile. To enable this donation, begin your shopping through the URL smile.amazon.com (instead of the usual www.amazon.com) and choose Living Bridges Inc from Aptos, CA as your nonprofit. That's it! Living Bridges, which sponsors Guaria de Osa's Marine Turtle Conservation Project, will now receive 0.5% of all your Amazon purchases as a donation from Amazon Smile. Footwear: In general: fast-drying sandals (non-leather); flip-flops; a pair of lightweight hiking boots or sneakers. Flip-flops are great for walking the Guaria campus and beach walking (especially when the sand is very hot). Flip-flops are not the proper footwear to wear when you are in the boat, as the waves will scoop them off your toes when you transfer from the boat to the shore. For this occasion, a non-leather sandal that stays tightly on your feet is best. Bring a small jar of Vick's Menthol Vapor Rub and Calamine Lotion to rub around your ankles to control itching from possible chigger bites. All mosquito repellents (such as DEET), applied to skin and clothing, are effective at repelling chiggers. A suggestion to not eat bananas or other sweet foods may diminish the attraction of bugs to your otherwise sweet skin. Vitamin B1 mg has the reputation of repelling mosquitoes. Although there are almost no pestering insects during the dry season - December through early April Ð people who may be susceptible to be bitten, it is suggested to take B1 plus B100 mg.
Flashlight or headlamp with extra batteries; because solar lights go out at 10 pm, your flashlight will come in handy for nighttime reading and walking on Guaria's campus. Note: watch for frogs that come out at night! Hammock: a non-nylon hammock will come in handy during evening ceremonies (unless you want to purchase a Secoya Hammock for about US$500). In order to hang your hammock, bring a pair of caribiners (2) you can purchase in any hardware store; and 20 feet of strap also called webbing;; ask salesperson what kind of webbing is recommended to hang a hammock. Note: What to bring for art-making activities with Jais? 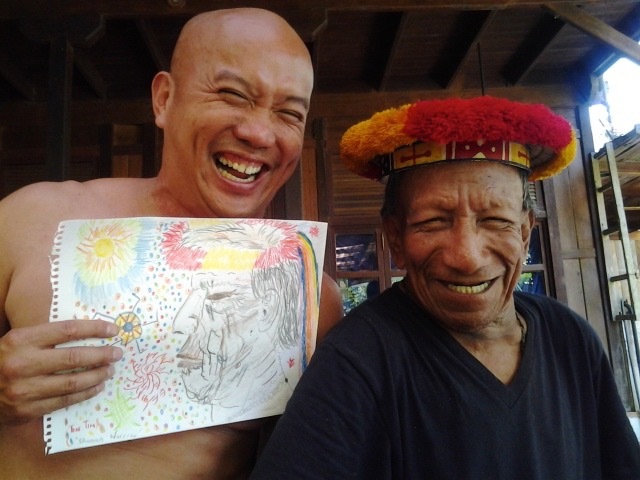 Art supplies will be provided for expressive arts therapy to facilitate integration of experiences during the Rainforest Medicine Council. However, bring your own art supplies if you also wish to paint on location with Jais. For example: small watercolor kits, paper, brushes, tempera paints. No oils, or oil pastels, as the cleanup is challenging. No art experience necessary. Want to do arts & crafts with the Secoya elders? If so, please bring glass beads (small and medium size beads) and small seed beads; needles and nylon. Games/Sports: kites, frisbees, dominoes, chess, checkers, cards; soccer, volley, basket ball, etc. Aloe Vera Gel: for sensitive skin; good to rub on after a sunny day; Bioland makes a great Aloe Vera gel, 100% organic and can be purchased in any macrobiotic or most pharmacies in Costa Rica. Head-lamp or flashlight - bring back up batteries - rechargeable is the best. Note: if your flashlight has a red light this would be the best one to bring. If not, when you turn on your flashlight during the ceremony cover the bright light with your shirt (or something) so as not to disturb the others journeying with the bright light of your flashlight. For women and men: loose fitting clothes - especially around the waist. For women: loose, flowing skirts are very appropriate to wear during ceremony. Beads: for beading and jewelry-making after ceremony inspired by Secoya designs in the company of the elders. Beading needes, threads, and was. Preferably small, glass beads; preferably primary colors such as red, yellow, green, blue, and white. Beading needles, thread and wax. Hammock - If you have one to bring, please make sure it is not made of nylon. There will be Secoya handmade fiber hammocks for sale and a few Guaria de Osa hammocks available. To hang your hammock purchase at any hardware store: 2 simple caribiners and 20 feet of strap also called webbing; tell the store the webbing and the caribiners are to hang a hammock. Important to read more on our Disclaimer and Safety Rules to the right of the sunset photo at our Fees and Reservations page. Please read in full. Please note: Guaria de Osa is not a resort, nor a spa, nor a hotel. Instead, Guaria de Osa is a roadless, wilderness discovery centre, powered by the sun, rooted in a rainforest beach / ocean environment on the Osa Peninsula, also known as 'the Little Amazon of Costa Rica" - endorsed by National Geographic as "the most biological intense place on Earth!" Guests will undertake full responsibility for all that is experience because essentially your sojourn at Guaria deOsa, albeit an enriching adventure, is a personal experience. Guaria de Osa wishes to reserve the right to change the itinerary if by chance there may arise unforeseen circumstances, such as raw weather or sea conditions or other physical or material logistics that may surprisingly arise. This also includes last minute cancellations by guest teachers. Please trust that whatever changes are made, these will not affect the quality of the experience. All guests are financially accountable for breaking or loosing any Guaria de Osa items or belongings – including surfboards. If such an occasion should arise, we ask for reimbursement at the current cost in Costa Rica of the particular item that needs to be replaced. We ask that you sign in and sign out or inform Jonathon when you leave the campus. Please take your walks and swims with a buddy. Respecting cultural sensitivity, we ask that you keep your swimsuits on when swimming in the ocean and/or sunbathing on the beach. Please note: Guaria de Osa is not a resort, nor a spa, nor a hotel. Instead, Guaria de Osa is a road-less, wilderness discovery centre, powered by the sun, rooted in a rainforest beach / ocean environment on the Osa Peninsula, also known as 'the Little Amazon of Costa Rica" - endorsed by National Geographic as "the most biological intense place on Earth!" When in the ocean, the safest way is always to swim, surf, or snorkel with a buddy and keep an eye on each other. Guaria's beachfront is safe for swimming most of the time, especially at low and mid-tides. Sometimes, at high tide, there can be a rip tide that can pull a swimmer out about 25 to 3 yards. If this happens, don't panic! What takes place is a current draining a channel on the edge of the ocean. The current extends no more than 35 yards, after which there are no strong currents or undertows to worry about. Just let the tide pull you out, then swim off to the side and swim back in to shore. About a 15 min. 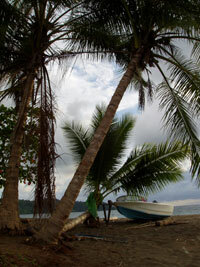 beach/forest walk north is Playa San Josecito, a paradisiacal and safe beach. When wandering about at night, it is best to use a flashlight because thee are snakes in the forest. Special care should always be taken when stepping over a log. It is best to step on the log then jump off the other side rather than stepping over the log … since there may be a poisonous snake under the log on its other side. Be careful when picking up anything off the forest floor or reaching your hands into the bushes. Snakes, for the most part, are passive. If you encounter one, please don't offend it or irritate it or scare it by neither calling it names nor yelling. Let your guide know if such a snake is in the immediate vicinity of Guaria de Osa's campus. What you can do is to greet the snake and move on if it is out in the forest far from the campus. Sleep well for no one has died in the area from snakebites and the nearby clinic is always loaded with anti-venom for the unfortunate accident. No one has gotten bit from a snake bite at Guaria, except one of our dogs … and we cured him with our effective vegetable snakebite medicine, a cultivar from Costa Rica and the Ecuadorian Amazon Rainforest, now growing in our ethnobotanical garden. There are scorpions yet they are relatively harmless and their stings are like that of a wasp. If you are allergic to bee or wasp stings, please bring your necessary precautionary medications with you and carry them in your daypack at all times! Coconuts might be the biggest hazard. When napping or lounging under a coconut tree, be mindful because one might just fall on your head – although this rarely has happened to anyone at Guaria de Osa. Ana has an attitude! Typically, the nature of macaws is to be very territorial. She is loved, gorgeous, and grew up at Guaria. She might travel with you on the beach and watch over you from the trees … while Tin Tin, Guaria's pet dog might walk with you and watch your bags. About Ana ... she is usually friendly yet sometimes she's not. By the way… Ana is not a 'she' anymore. We got her feathers tested and found out Ana is a 'he.' However, its name has not adjusted to her gender. Since the structures of the lodges are all wood, never leave a burning candle unattended in order to prevent a fire. Many of these safety rules are not unique to a rainforest-jungle-ocean- beach environment. Still and all, in order to prevent injuries anywhere geographically, being present and exercising mindfulness is a good thing when having fun. Because funds are processed immediately for events, maintenance, and ground-level projects in the Amazon and Andes of Ecuador and on the Osa Peninsula of Costa Rica , we are sorry we cannot make any refunds. Although your investment is non-refundable, it is fully credited for up to 3 years. Should a price increase occur within that time frame, guest agrees to cover the balance due when re-scheduling. The investment is non-refundable, but is fully credited for another Council for up to 3 years. Should a price increase occur within that time frame, participant agrees to cover the balance due when rescheduling. Guests will pay for the entire block of time reserved by an event. No refunds or credit is given when and if anyone is dissatisfied. Because of the remoteness of the Osa Peninsula and because there are no roads to Guaria de Osa, whether one has to arrive late and/or depart early, there is no refund nor credit because the staff has prepared for your visit with food, supplies and more. Guests will undertake full accountability for all that is experienced because, albeit an enriching adventure, essentially your sojourn is a personal experience. Expect the Unexpected ... and you will have everything. We reserve the right to change the itinerary if by chance there may arise any unforeseen circumstances, such as raw weather or sea conditions or other physical or material logistics that may surprisingly arise. This also includes last minute cancellations by guest teachers. Please trust that whatever changes are made will not affect the quality of your experience. When an Event Participant cancels his/her reservation, any monies received will be credited for any future program/event valid within three years of cancellation - or - Event Participant can give or sell the original dates to someone else. Please notify us of any change. Credit within three years can also be transferable for another event to a friend, family member, colleague, etc. Event fees are subject to change and will be recognized by the Event Participant. "The retreat at Guaria was both beautiful and lasting. Jonathon Miller Weisberger and his dear friends, the Secoya Elders, were delightful, sincere, and joyful guides. The retreat center was a magical permaculture garden, perched on the edge of the pacific with a fantastic, quiet beach. The food was delicious, and the staff felt like family by the end of the retreat. The land sprouted every possible medicinal plant, carefully tended by Jonathon. I wandered the paths of a living health food paradise. Jonathon led me through the jungle, sometimes bushwhacking! I tasted new plants, and learned their properties, while Jonathon collected new specimens for the retreat center. I saw fantastic birds and began to see the life of the jungle through his eyes. "The pleasure of the experience is beyond words! I look forward to the time when I am able to return for another council gathering." - Annette J. All with the playfulness of a Secoyan! Upmost beautiful honor, thank you." we thank you for passing the news on to others about this significant event.